← Where is top-down switch Chrysler 200 Convertible? When Don Emerson was in college at Western Maryland a fellow classmate drove a BMW. The road manners of that car impressed Emerson. Upon graduation the young man settled in the Houston area and soon he began searching for a car to replace his 1971 Dodge Demon. Emerson was looking for a sporty car that handled well. “I was a free spirit at the time,” he says. With money in his pocket, Emerson investigated suitable cars available in 1975. He narrowed the candidates down to four finalists: MGB GT, Volvo P1800, Fiat 131, and a BMW 2002. Knowing that he would be doing a lot of touring in the car, Emerson selected the comfortable 1975 BMW 2002 model. 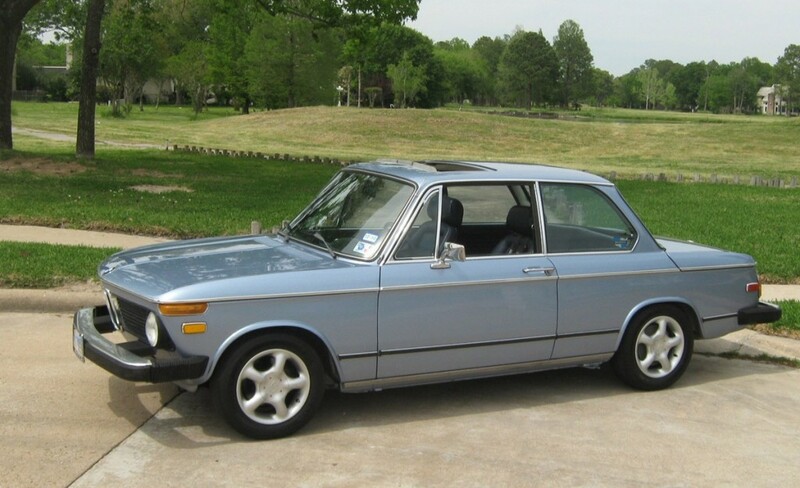 Emerson went to the Bavarian Autohaus in downtown Houston and in December 1975 drove out in his new Fjord Blue BMW. The car was equipped with big government-mandated safety bumpers. The 2002 two-door left the BMW factory with a 110-horsepower, 2.0-liter, four-cylinder engine. Inside the cabin, beneath the white headliner most everything is awash in blue. The seats and door panels are blue, as is the carpet. From the factory the BMW had a four-speed manual transmission. It has since been replaced by a five-speed gearbox with a shift lever sprouting from the floor. “Everything winds in the car,” Emerson explains as he points out the crank-operated windows and crank-operated sunroof. The steering and braking work without any power assistance. 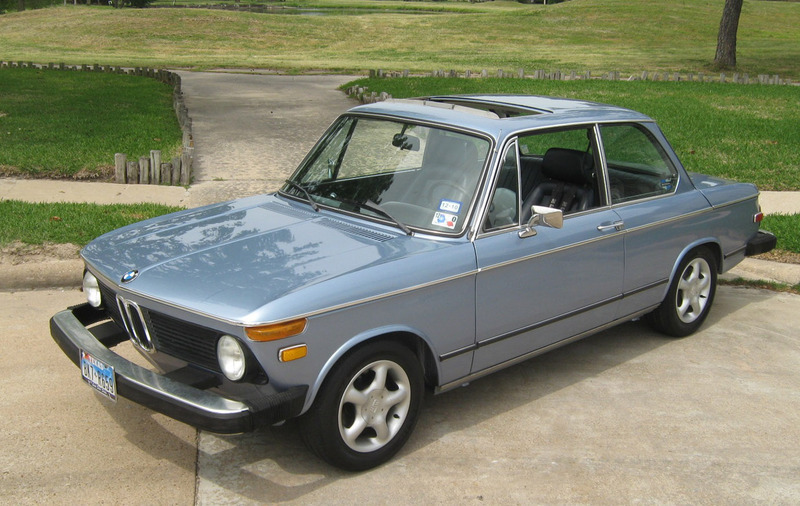 The 1975 BMW is equipped with a manually operated sunroof with a built-in wind deflector. When the summer sun makes the cabin uncomfortably hot the sunroof can be closed and the air conditioner activated. “The paint failed the first year I had it,” Emerson laments. Under warranty the defective paint was removed and the car repainted. Emerson says he racked up more than 20,000 miles during that summer. The BMW performed flawlessly with the exception of a broken fan belt in Colorado. He was surprised to quickly find a replacement part for his foreign car. Over the years Emerson has discovered a lot of the parts on his car, such as a distributor cap, are interchangeable with the parts used on a Volkswagen. The VW part is usually much less expensive than a corresponding BMW part, he says. “It was my daily driver until 1993,” Emerson says. That is when he was coerced by a performance-oriented car mechanic to turn the BMW into a racing machine. After racing his BMW with the model name “2002” until the year 2002, Emerson decided to return his car to street legal status. The car underwent body surgery as the doors were replaced and damaged body panels were cut off. Both front fenders and one rear fender were replaced and the entire car was stripped to bare metal before being resprayed with the original Fjord Blue paint. The restoration took about a year to complete. Emerson declared the work complete when the interior was reupholstered. At the base of each front bucket seat is a small wheel that turns to recline the seat back. Only one wing vent window and the back glass remain original, the other windows were replaced during the restoration.